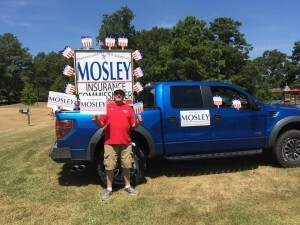 Clinton Body Shop owner John Mosley said Wednesday that while disappointed in the outcome, “I have no regrets” about challenging incumbent Mississippi Insurance Commissioner Mike Chaney in Tuesday’s Republican primary. And if Chaney doesn’t make changes, Mosley vowed to run again in four years. “It was a disappointment for sure,” Mosley reflected the morning after the primary, which according to 11:45 a.m. results from the Jackson Clarion-Ledger saw him lose with 72,140 votes to Chaney’s 189,219 (72 percent to 28 percent) with 99 percent of precincts reporting. Chaney was unopposed in the 2011 Republican primary. In 2007, he won it with 136,887 votes (79 percent) to Ronnie English’s 36,586 (21 percent). When compared to English, who wasn’t even running against an incumbent commissioner, Mosley seems to have made more of a dent. “I had the sentiment of the public,” Mosley said, but argued that he was “fighting more than a candidate” in the Mississippi political regime and the insurance industry. Mosley blamed State Farm for what he said was a last-minute “scare tactic” push to convince voters that the company would leave the state if Mosley won. State Farm was the No. 1 auto and home underwriter in Mississippi as of 2013, according to an Insurance Information Institute chart using SNL Financial data. “People got scared,” he said. Late in the race, Mosley provided a July 30 letter apparently from State Farm agent Steve Higginbotham attacking him as a “fox in the hen house” who was “advocating an Agenda that helps his businesses and will end up costing you the consumer and damaging the viable Insurance marketplace we currently have.” He said another State Farm agent had sent out a similar letter. Gadson pointed to this statement Wednesday when asked about the alleged State Farm “scare tactic” regarding its presence in the state. Mississippi wasn’t the only state to see a collision repairer running for office in 2015. Parker Auto Body owner Matt Parker has challenged incumbent Louisiana Insurance Commissioner Jim Donelon in that state’s long Republican primary season. Mosley, who said he spoke to Parker on Election Night, said other candidates need to be aware of “the level they’ll (opponents) stoop to” to prevent an auto body candidate from running. “He needs to have a copy of those letters,” Mosley said, so a candidate like Parker could “try to dampen the effect” of opponents’ attacks by giving the right information to voters. He also was frank about the support about the auto body industry gave him compared to the insurance industry’s support for Chaney. Mosley had forsworn donations from the insurance industry. Chaney had at least $52,600 from insurance industry sources from Jan. 1-July 28, 2015, about 19.2 percent of the $279,180 he’s raised overall this year, based on a Repairer Driven News look at state campaign finance reports (see chart). Overall, the collision repair industry and related sectors had given Mosley about $14,300 of the $204,300 he’d raised from Jan. 1-July 27. His campaign received some donations from the industry in other states — Osborne Bodyworks in Georgia contributed, as did Shiptrack and the Overnight Parts Alliance in Alabama — but his automotive support generally seemed to be from Mississippians. Another hurdle for other collision repairers seeking office could be keeping one’s business afloat while one’s off on the campaign trail. Mosley praised his staff for running the Clinton Body Shop locations smoothly while he’s gone, noting “you couldn’t do what I did” without employees you trust during an absence. “My guys did a great job,” he said. Despite his bitterness towards the insurance industry, Mosley indicated he wouldn’t run again if Chaney addressed the concerns he raised during the campaign. He recalled an unsuccessful run for mayor which “had a good impact.” According to the Neshoba Democrat, Mosley as an independent took 38 percent of the vote but lost the 2005 Clinton mayoral race to Republican Rosemary Aultman. “We wound up being better friends,” Mosley said; Aultman recognized his concerns and made some pro-business changes in the city. “I supported her 100 percent after that,” he said. Otherwise, watch out in 2019, according to Mosley. “Next time, I’ll be a lot better educated candidate,” with “four years” to continue to sway voters. “It’ll be a whole different ballgame,” he said.